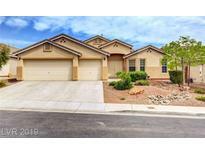 Below you can view all the homes for sale in the North Ranch Estates subdivision located in North Las Vegas Nevada. Listings in North Ranch Estates are updated daily from data we receive from the Las Vegas multiple listing service. To learn more about any of these homes or to receive custom notifications when a new property is listed for sale in North Ranch Estates, give us a call at 702-323-5963. No Carpet -large ceramic tile throughout, plenty of storage, and all appliances included in the sale. MLS#2089381. Keller Williams Market Place I. Quiet neighborhood convenient to the 215! MLS#2086885. Realty ONE Group, Inc.
With it's high ceilings and open floor plan, you're sure to feel at home! MLS#2081734. EXIT Realty Number One. Whether used as an investment or as your next home, you will enjoy this spacious and move-in ready opportunity. MLS#2081328. Premier Realty Group. This home includes a 3-car garage on a nice, quite corner lot, granite kitchen counter tops, stainless steel appliances, high ceilings to accompany an outstanding, open and spacious floor plan! Come see it for yourself! MLS#2067103. Executive Realty Services.